A few weeks ago, I was able to take my first trip to the Cape! 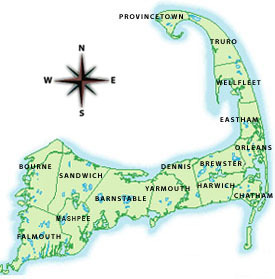 “The Cape” or Cape Cod is, according to Wikipedia, is an island and a cape in the easternmost portion of the state of Mass. Some locals have also explained this area to me as the “muscle” of Massachusetts, because it looks like the state is flexing its arm. 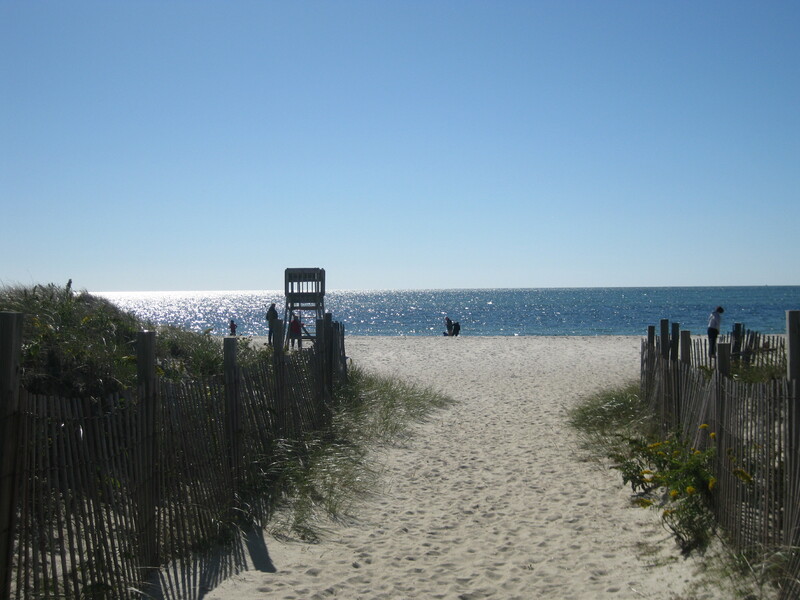 Having lived in Mass for more than four months now, I’ve heard people talk about visiting the Cape for weekend vacations, especially in the summertime. I have to say though, I’m not sure what I was expecting the Cape to look or feel like. I’ve lived in beach areas and visited various coasts including California and Florida but the Cape looks like nothing I’ve ever seen before. In true New England fashion, pristine old houses lined the waters – painted in grays and pastels with white trims. The beaches were a coarse tan sand, surrounded by dunes of willows and other greens. To me, the Cape looks just like it is pictured in post cards (which I didn’t realize was the Cape until after going). The area has a ton of history, especially related to the Kennedys. While in Hyannis, I visited the JFK Museum which focuses on the family and late president’s time in the area. It was very interesting to see photos of the family on their vacations, especially if you think about how JFK lived in a time before the paparazzi! There’s no way you could get that close to a president, let alone his family on vacation, now a days. According to the Duckmobile tour guides, tourists frequently ask to see the Kennedy compound but its not possible to get close to the buildings and if you did, you would only see a huge wall. It’s kind of a surreal feeling to think about how much history New England holds, especially such a small area like the Cape! Another Kennedy family favorite in Hyannis is bar and restaurant called Baxters Boathouse. Walking in, you automatically feel like you are in a yacht club but without any pretentious stigmas. The patrons generally seemed to be having a great time, and the service was excellent. I ate my first lobster roll here, which is an infamous New England dish of lobster meat with mayo on a toasted hot dog bun. I’m not sure that I will be able to try a lobster roll anywhere else now because the one from Baxters was incredible! It had a huge helping of lobster meat – which was incredibly tender and flavorful. Keep in mind that this is also the end of lobster season! the proper accent). The best chowder that I’ve had can be found at Captain Parker’s Pub! Now, I had a chance to sample this chowder in July during Boston’s annual Chowderfest. A small sample really isn’t enough though. I would definitely recommend ordering a bowl! So great – I really couldn’t get enough!! Besides food, my first visit to the Cape was really amazing! It is such a great place to relax and escape the big city. At least in Hyannis, there is a small town feel and the residents are incredibly welcoming! I’m sure I’ll be going back again soon though I can’t wait to see what it’s like in the summer!! This entry was posted on Monday, October 25th, 2010 at 12:39 am	and tagged with Boston, Cape Cod, chowder, lobster roll and posted in Uncategorized. You can follow any responses to this entry through the RSS 2.0 feed.